We immediately begin our Arctic adventure upon arrival. We recommend flying to Harstad/Evenes airport (EVE) from Oslo for convenience. Please make sure be to there as early as possible, or even arrive one day early. 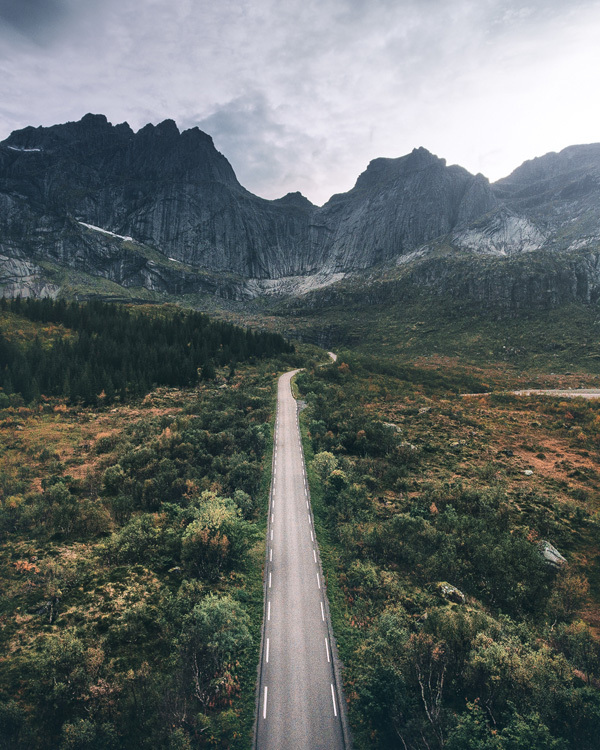 Upon arrival in Harstad/Evenes airport, we will board our spacious vans and drive straight to our rorbu cabins (a Norwegian traditional type of seasonal house used by fishermen) in Reine. These cabins are authentic, comfortable and warm. They include a fully equipped kitchen, heated floors, shower, and comfortable beds. As soon as we are settled in, we will have a group dinner and be on standby in case the Aurora Borealis shows up. If we are blessed with starry nights and clear skies, we will be able to capture the elusive and strikingly beautiful Aurora Borealis aka Northern Lights as she dances seductively on the night skies, right outside of our cabins. 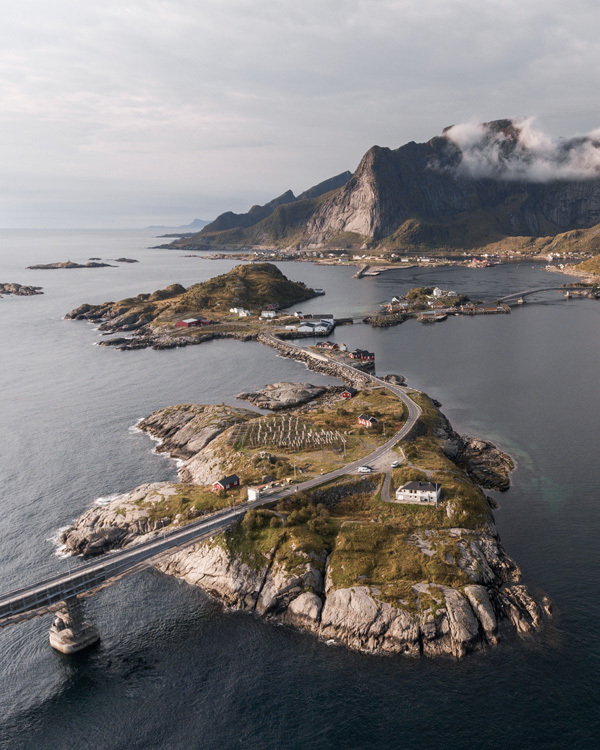 Our base camp for the first leg of the tour will be on the island of Moskenesøya. This island is a world class location, and the likes of National Geographic, Lonely Planet and The Huffington Post and have all listed this very village as one of the most scenic villages on earth. 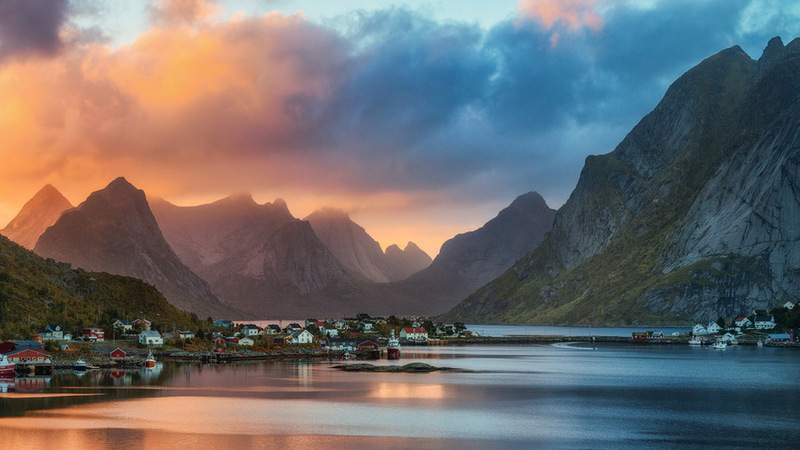 One look outside your bedroom window, and you will understand why - incredible granite mountains rising straight out of the fjords, traditional fishermen cabins, and the location just oozes of great Norwegian history. 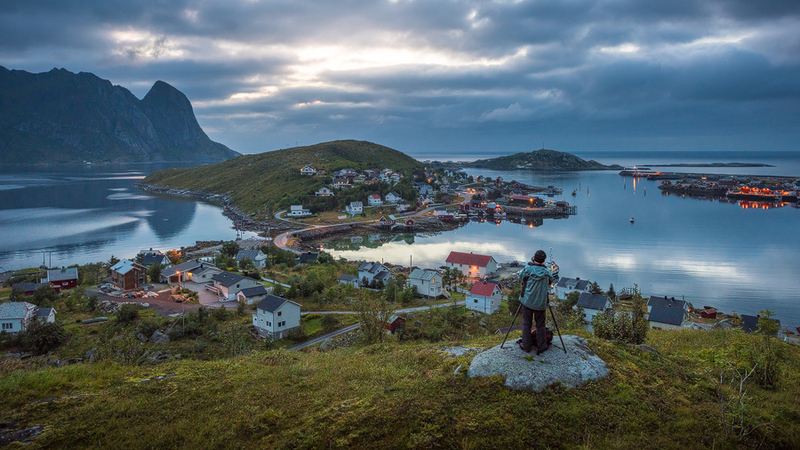 In addition to Reine, we'll also spend time exploring the surrounding areas such as Flakstad (Skagsanden), Fredvang, Nusfjord, Ramberg, Vareid and Selfjord, which are all stunningly beautiful. If we're lucky, we'll have Northern Lights galore as we head to our second base camp, which is Bjerkvik; further inland in Northern Norway. While staying here, we will explore some unknown yet spectacular locations that are off the beaten path. We will also make sure to take you to world renowned locations such as Stetinden and Skjomen. All of these areas are well suited in regards to photographing the aurora. 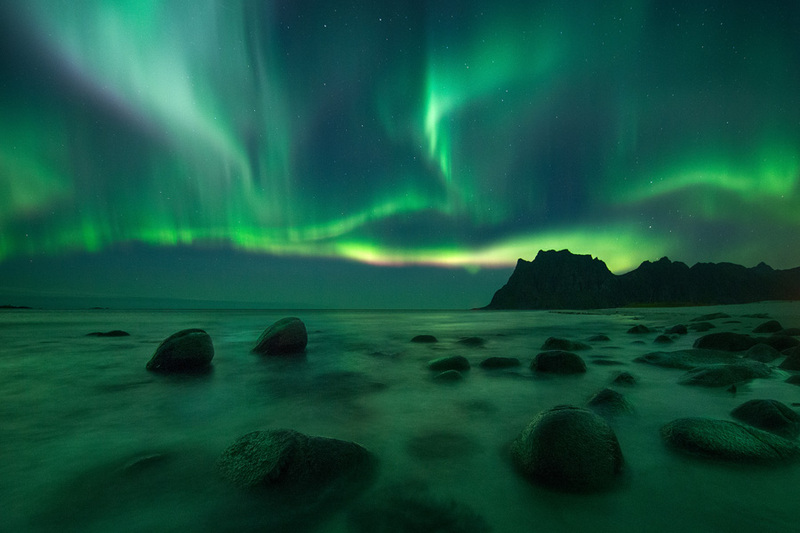 As long as the weather is good, we will have a high chance of seeing the Northern Lights. Bjerkvik Hotel is only 30 mins from the airport, which makes your departure easy on the final day. The final day is reserved for winding down, packing up, and preparing for departure from Harstad/Narvik (EVE) airport. Sunrise excursions will be held on days leading up to departure, but not on the final day. Since we are exploring the high arctic and northern Norway archipelago's, you have to be well equipped for all kinds of dramatic weather including snowfall. Bring comfortable, warm and waterproof outer layers such as Gore-tex, thermal underwear, crampons and water resistant boots, or even waders. A complete list of recommended clothes as well as camera gear will be provided upon registration. We will not have clothes or shoes available for renting. Will I experience snow or ice? The winter months in northern Norway are known to generate a great amount of snowfall. That being said, we cannot 100% guarantee that it will be a white snowy workshop for the whole duration of the workshop. We will certainly do our utmost to make that happen. We can never predict weather and guarantee clear skies and brilliant displays of the this elusive phenomenon, but we will chase it for all it's worth throughout the entire week. If that means late nights and early mornings, so be it. We can all catch up on sleep after the workshop! What does traditional fisherman hamlets entail? Bookings are based upon double occupancy, which means that two people will share a bedroom. Please note that a single room does not mean that you get your own cabin, it simply means a private room with shared bathrooms and kitchen. A private cabin is an extra option for those who want privacy. All cabins come with fully equipped kitchens, showers, heated floors, Wi-Fi, sheets and linens, towels etc. We base the tours and workshops around preparing our own dinners in the cabins, and will shop for groceries throughout the week. For those who are not keen on preparing their own food, there are restaurants on site that can cater to your wishes. 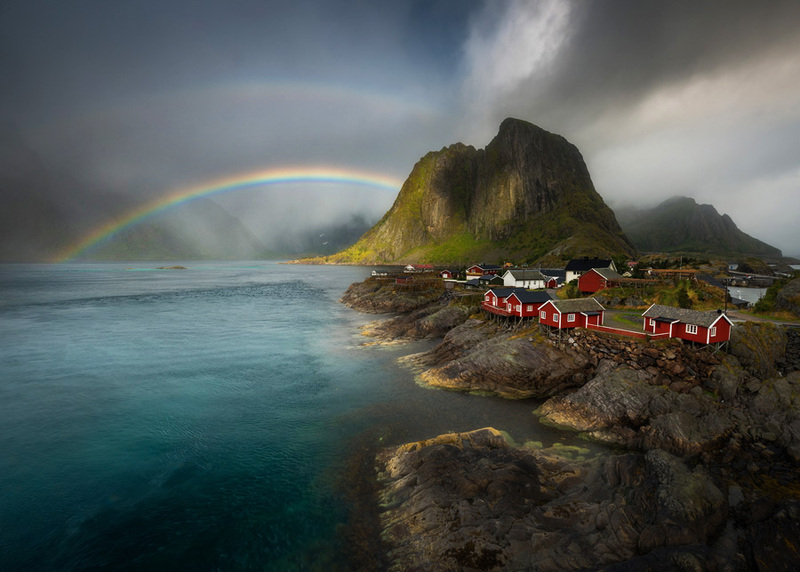 The weather and climate in northern Norway is renowned for being extremely unpredictable because of its many local weather systems. This means conditions can change within minutes and kilometers, also resulting in very dramatic light and photographic opportunities. 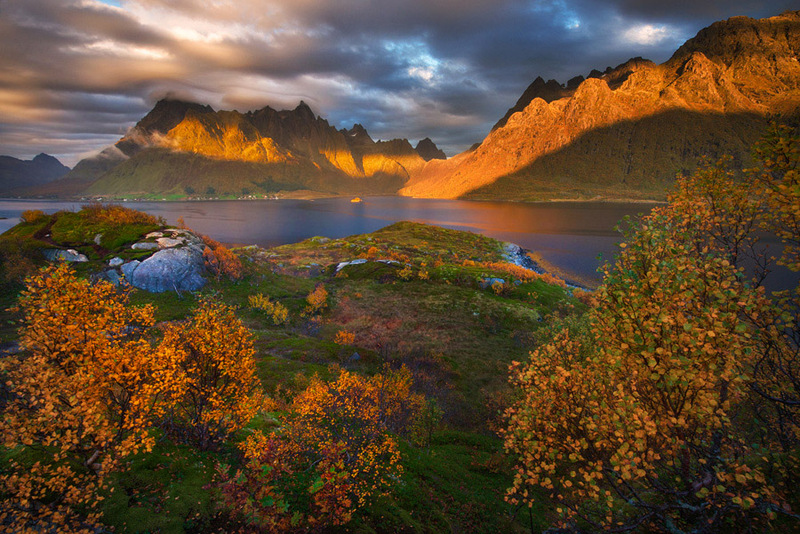 Lofoten has a much milder climate than other parts of the world at a similar latitude, such as Greenland and Alaska. This is due to the temperature of the water of the Gulfstream. The coastal climate results in mild winters and cool summer temperatures. Traditionally, January and February are the coldest months with an average temperature of -1 degrees Celsius. At the very least, bring your own camera, lenses, tripod and a laptop. A detailed list of recommendations will be provided upon registration. If you are considering upgrading or investing in new camera gear prior to the trip, feel free to ask us for advice. 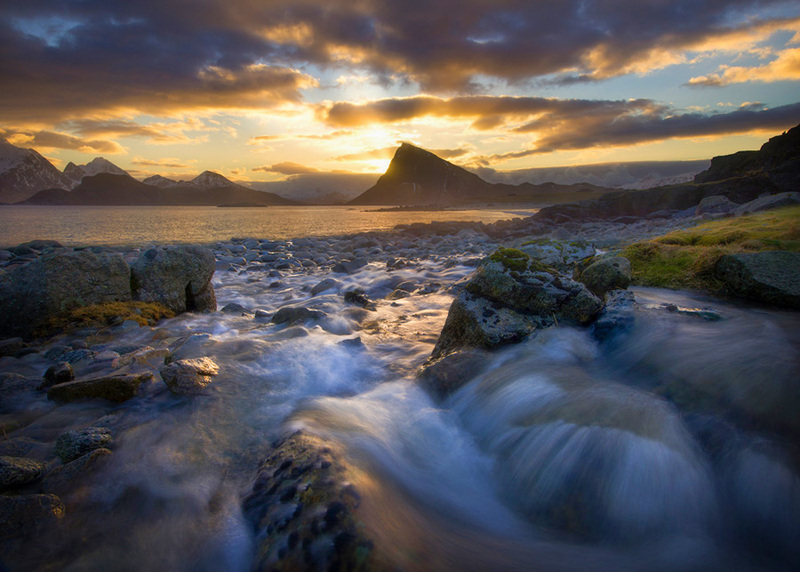 The easiest way to travel to the Lofoten archipelago is via Oslo Gardermoen airport (OSL code). From there you can fly to Harstad/Narvik Evenes airport (EVE code) where our tour starts. This tour is open to digital photographers of all skill levels. Our only criteria is that you have a great passion for photography, and have the energy and motivation to be on the go each day and night. A packing list will be provided. If you have additional questions, the trip leader will be happy to answer them over the phone or by email. This photo workshop is all about in-the-field field photography and situational instruction, working alongside your trip leader, and there will be no classroom workshops or presentations, unless there is extra downtime from rainy weather. Photographic topics that will be covered while shooting include classic landscape photography composition and technique, HDR (High Dynamic Range) imagery, panoramic photography, adventure and travel photography, tilt/shift focusing, slow shutter speed effects, and exhaustive use of filters. We will also be going on some shorter hikes (2-5 hours) to truly experience the land. Group participants may wander on their own occasionally if they wish to pursue individual photographic objectives, enabling each participant to get the most out of this once-in-a-lifetime trip. A small group size of photographers ensures you will receive ample personal photographic coaching in the field from a full time working pro, maximizing the group's flexibility and ability to shoot more places, more spontaneously based on light and weather, and provide an intimate small group adventure experience. Johnathan Esper of Wildernesscapes Photography LLC, based in the USA, will be leading the trip. Johnathan is a full time photographer and experienced international photo trip leader with over 60+ successful workshops and tours. Every trip so far has been an incredible experience for the participants. 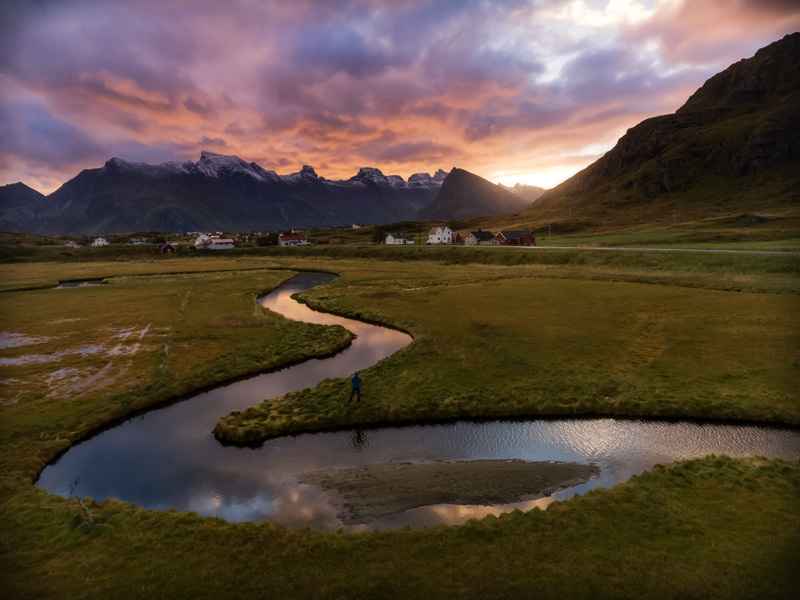 He specializes in wide panoramic landscapes and adventure photography in Iceland and the Adirondack region in the USA. Final Payment: The final payment for the balance due on the trip (after your paid deposit), is due one week prior to the trip start. Payment options include bank transfer to my Icelandic bank account (details on request), cash in person at the trip start (with prior permission), personal or bank checks (preferred for USA and Canada clients), and credit cards (a 2% credit card fee will be added for final payments with card). Cancellation Policy: In the unfortunate case if you need to cancel, cancellation policy is: deposit payments are refundable as 100% future scheduled trip credit up to 120 days before trip start, 50% future scheduled trip credit if cancellation is 120-60 days before trip start, and non-refundable less than 60 days before start. Final payments for the full trip balance are 100% refundable as cash until the trip start, and non-refundable after the trip start. If I am able to fill your empty spot on the trip, half of what you'd lose will additionally be returned to you, for all the above situations. If I cancel the trip for some major reason such as trip leader health crisis, etc, then I fully refund everything in cash or PayPal, or a pro-rated amount if the trip must end early for the same reasons. I am not responsible for reimbursing you for travel or other ancillary expenses you incur in prep for the trip.